Just one day after her party’s success in the German federal elections yesterday (September 14), Frauke Petry, co-chair of far-right party Alternative for Germany, said she would not be part of the parliamentary group. Petry’s surprise announcement after the far-right AfD won around 13 percent of the vote in Germany’s elections, an historic result meaning that the party would not only enter parliament for the first time but also as the third strongest party. The news appeared to come as a shock to her colleagues, with fellow co-chair Jörg Meuthen telling German press agency dpa, that he “had had no knowledge” of the decision beforehand and called it “a bombshell”. “I want to practice real politics in the spirit of good conservative politics and be part of the actual shaping of things,” Petry said. She did not lead the party in this year’s elections, which was allegedly due to differences in opinion on the party’s direction. 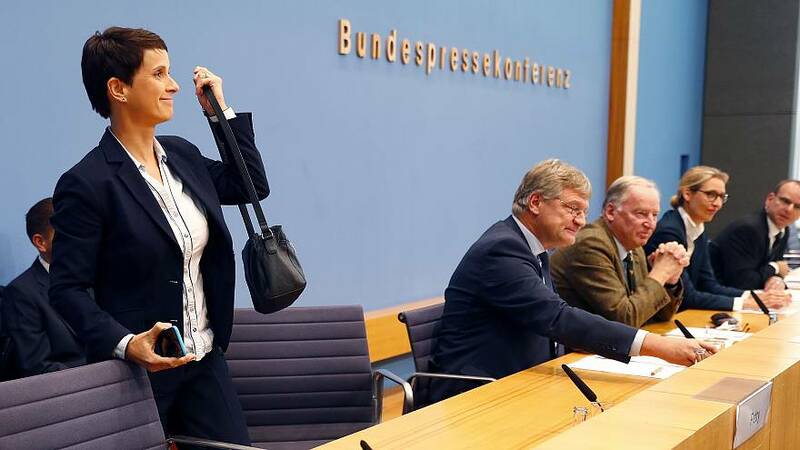 The AfD founding member left the press conference after explaining that she would not be answering any questions.